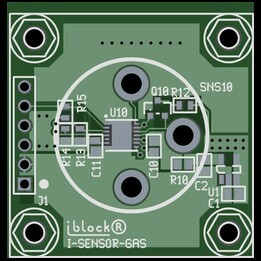 The iblocks SENSOR-GAS board consists of an interface sockets for a Type 4 electrochemical cell and an analog front end. The analog front end generates a voltage that is proportional to the cell current. Gas sensitivities from 0.5nA/ppm to 9500nA/ppm are supported. 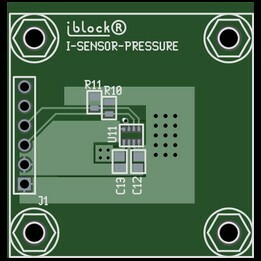 The iblocks SENSOR-PRESSURE is an digital absolute barametric pressure sensor. Operating pressure range is 300 - 1100hPa. Communications is through an I2C interface. Operates with a single 1.2V - 3.6V supply. 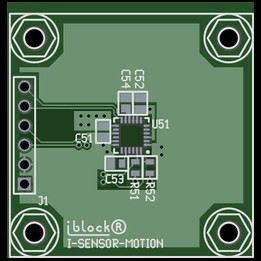 The iblocks SENSOR-MOTION is a 9-axis motion tracking device that combines a 3-axis MEMS gyroscope, a 3-axis MEMS accelerometer, a 3-axis MEMS magnetometer and a hardware accelerator engine. Communications is through an I2C interface. Operates with a single 2.4V - 3.4V supply. 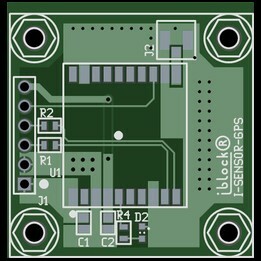 The iblocks SENSOR-DISTANCE is a distance measuring sensor block based on the Sharp GP2Y0D8100F. The sensor works with a variety of reflective objects. The output voltage of the sensor will stay high if an object is beyond the specified range (typically 100mm). Operates with a single 2.7V - 6.2V supply. Typical current consumption is 5mA. 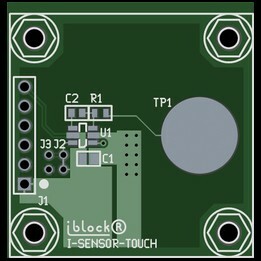 The iblocks SENSOR-GPS utilizes the GPS MT1339 chipset which achieves the industry's highest level of sensitiviy (-165dBm) and instant time-to-first fix (TTFF). Power consumption is 82mW for acquisition and 66mW for tracking. The update rate can be set up to 10Hz. Operates with a single 3V - 4.3V supply. 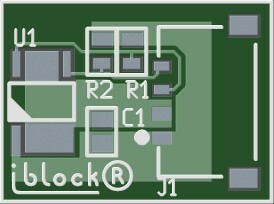 The iblocks color sensor is a 16 bit digital color sensor with an I2C output. It is sensitive to red (λ = 615nm), green (λ = 530nm), blue (λ = 460nm) and infrared (λ = 855nm) light. The sensitivity and integration time can be adjusted so that light measureements can be performed over a wide range. The recommended input operating voltage range is 2.25 - 3.63V. 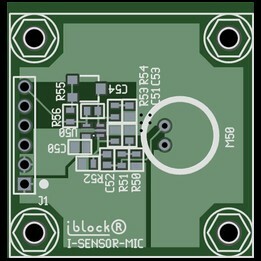 The iblocks SENSOR-MIC board consists of an electret condenser microphone and preamplifier. Gain is adjustable using the on-board trimpot. Operates with a single 2.4V - 5.5V supply. 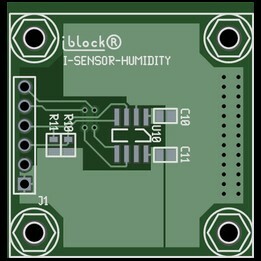 The iblocks SENSOR-HUMIDITY is a digital output relative humidity (RH) and temperature sensor. The RH accuracy is +-4% and the temperature accuracy is +-0.5degC. Operates with a single 2.3V - 5.5V supply. The iblocks SENSOR-TOUCH is a single key touch sensor with toggle mode (touch-on/touch-off) plus programmable auto-off delay and external cancel. Operates with a single 1.8V - 5.5V supply (32uA at 1.8V). 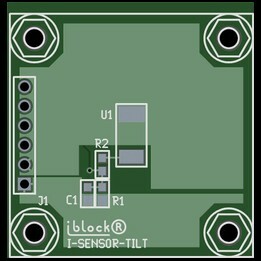 The iblocks SENSOR-TILT is a position sensitive switch that is normally open when vertical and normally closed below the switch angle (45deg). 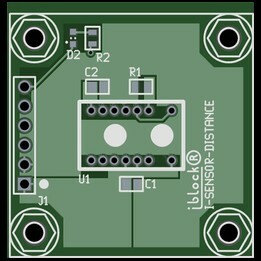 The sensor is fully passive and operates with very low currents (30uA @ 3.3V). Operates with a single 0.5V - 12V. The iblocks SENSOR-ALS provides ambient light sensing (ALS) that approximates human eye response under a variety of llighting conditions. 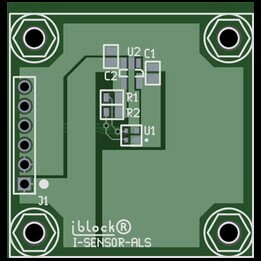 The SENSOR-ALS has three selectable integration times and provide a direct 16-bit lux output via the I2C bus. Operates with a single 2.9V - 5V supply.